Home > Blog > Articles > Quick wins for your vintage party! Quick wins for your vintage party! Following the success of last month’s post on how to plan a 1920’s themed wedding, we had a few people contact us who were planning to host their own vintage 1920’s themed event. As a specialist 1920’s band available for hire across the country, we’ve attended and performed at our fair share of vintage parties! That’s why we thought it’d be nice to share some quick wins for hosting your very own 20’s-do! Firstly, why not base your event on a speakeasy? That way you’ve instantly transported your guests back in time. Speakeasy establishments started in the US during the Prohibition era (1920–1933), when the sale of alcohol was illegal. As a result, secret bars were set up in hidden locations for people to get together and have a drink and a dance. They were called Speakeasies, for obvious reasons! Even though police would often raid them and arrest owners and patrons, they were so profitable that they continued to flourish. 1. Dust off your art-deco inspired design skills and get some classic invitations in the post. Start as you mean to go on and send snail mail invitations to give it that 1920s feel. 2. Subdue the lighting – stick a few muslins over the lamps/lighting at your venue to give the place a real smokey feel at little cost. Be careful not to create a fire hazard while you’re at it though! 3. Decorate your walls with richly coloured fabrics – hang them in the main room to cover up modern furnishings and give the venue even more of a hidden appearance. 4. Serve your drinks in cups and saucers to give the real feeling of hiding alcohol during prohibition. There’s nothing like pouring a cocktail from a teapot. 5. Set a strict dress code. With Downton Abbey, Boardwalk Empire and Mr Selfridge riding high as TV successes, people are in the dressing up mood and there is no better style than 1920s-chic. The most fashionable era in history deserves the best and your guests should help set the scene by dressing appropriately. 6. Lastly and most importantly, make sure you get the right music! They didn’t call it the Jazz Age for nothing. With many years’ experience entertaining at speakeasies and prohibition parties, the Jazz Spivs not only have the authentic sound, but the spiffy look too! We can even bring along our razzle-dazzle flapper girls who’ll get everyone on their feet to a cheeky Charleston. 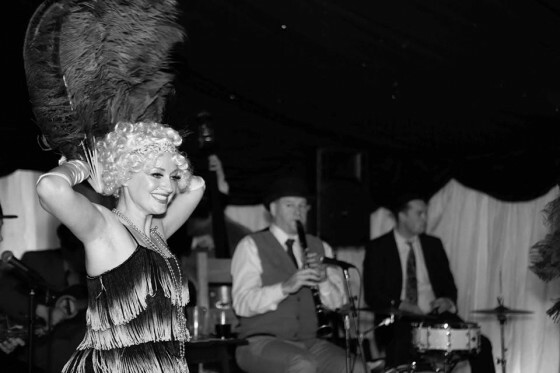 If you’re planning a vintage, 1920’s or speakeasy party and are looking to book an authentic jazz band, get in touch today or complete our online quote request form.